This result control item allows calculating forces and moments in the course of the simulation by integrating the pressure and skin-friction over a boundary. It is possible to select a set of boundaries to calculate the overall force and moment on them. It can be added under “Result Control” in the simulation setup tree entry. The user should supply the center of rotation (for moments), and write interval in term of simulation time step. The fluid density is specified under ‘Materials’. Write interval controls how often the force and moment values should be output/written. The value is the number of ‘Time steps’ between the outputs. 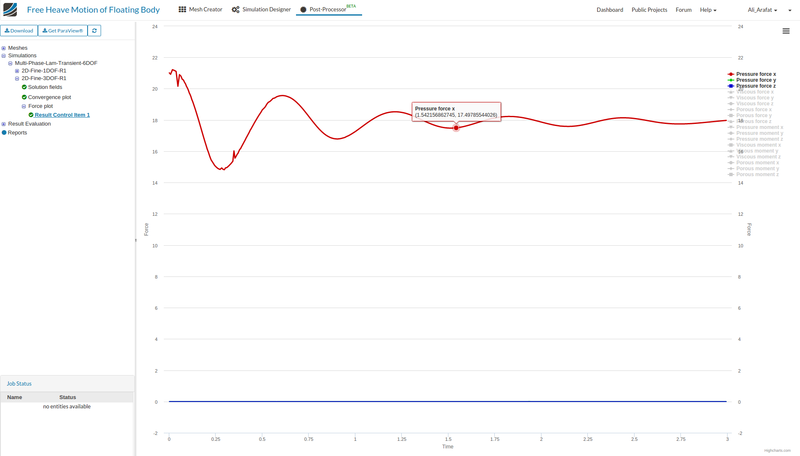 Values of force and moment are printed in the simulation log and their plots are available at the end of the simulation along with other results in the “Post-processor” tab. Alternatively, it is possible to calculate force and moments coefficients instead of force/moment values. In addition to the previous parameters, the user should supply lift/drag/pitch directions, freestream velocity magnitude, reference area, and reference length. The results are available in simulation log and as plots. Multiphase flow simulation, as the name suggests, models two fluids of different densities and their interaction with each other in the flow domain. This is done through a phase fraction variable \(\phi\) that takes a value of \(0\) for one fluid and \(1\) for the other. Depending on the case, one might be interested in computing the cumulative force of both or only one of the fluids on the object they interact with. For example, in the simulation of a boat sailing on a water surface represented by the following figure, one could calculate the net drag force on the boat due to both water and air, or only one of them. This page describes the procedure to compute this cumulative force and how to separate forces using the phase fraction. In order to post-process your results locally, ParaView should be installed on your system. 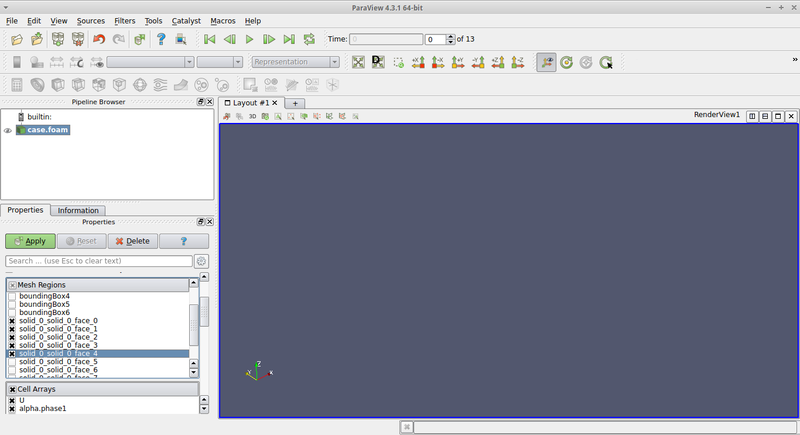 Depending on your operating system, the appropriate version of ParaView can be downloaded from here. Once a simulation is completed on the SimScale platform, the results can be downloaded to your local system. See the Post-processing via 3rd-party solution for a detailed description of how this can be done. By default, ParaView loads the entire data set. However, the interest now lies only on computing the forces on certain specific faces of the body. Therefore, before opening the case, please make a list of these faces. Start a new session on ParaView. Click on File-Open, select the case.foam, and press OK. 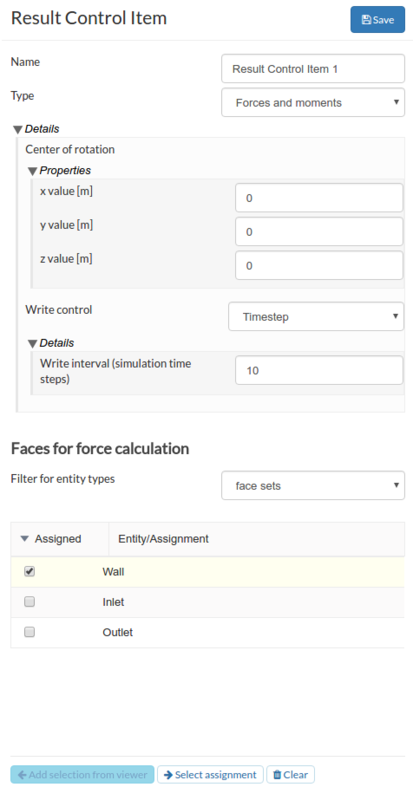 In the Mesh Regions sections in the Properties tab (see figure), select only those faces on which the force needs to be computed. Click on Apply. The case should now be loaded on ParaView. From the time navigation panel, go to the time-step at which you are interested to compute the forces. ParaView works as a sequence of filters applied to objects in its pipeline. 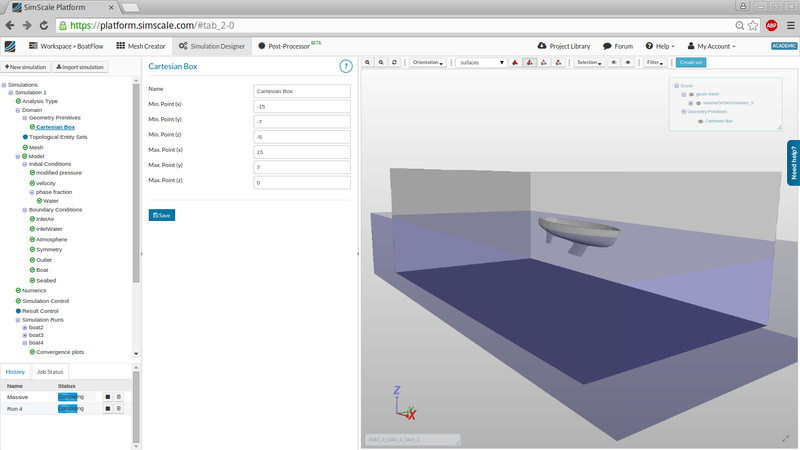 Select case.foam in the pipeline browser. This sets the active object for the filters. Click on Filters-Generate Surface Normals. A new object called GenerateSurfaceNormals1 will be created in the pipeline. There are several parameters that can be used to adjust the result of this filter. See this for a detailed description. Once finalized, click on Apply. ParaView computes the result and automatically sets GenerateSurfaceNormals1 as the new active object. In Step 2, we computed the normals on the faces of interest. These normals are scaled according to the area of the respective faces. Since we already have the pressure data on these faces, we can now easily compute the net force on each face. Click on Filters-Calculator. A new object Calculator1 is created in the pipeline. If need be, change the Result Array Name to something relevant, such as ‘Forces’. For total force, due to both phases, enter ” p_rgh * Normals ” in the text box below. ” p_rgh * Normals * alpha.phase1 ” for the phase which corresponds to \(\phi = 1\). ” p_rgh * Normals * (1 - alpha.phase1) ” for the phase which corresponds to \(\phi = 0\). Click on Apply. The force value is now available for each face. NOTE: The reason why density is not required as input is because we already know the static pressure. Therefore, simply multiplying with the area is sufficient to compute the force. The result of Step 3 is local to each face; in order to get the net force on all faces, this result needs to be integrated. A spreadsheet view opens up. The Forces tab displays the net force value (in \(N\)) in the three coordinate directions.